Celebrate National Cheese Day with some of the country's most popular (and most despised) cheeses. Lifetime movies. Matching tattoos. Leaving cute messages for loved ones in unexpected places. These are really cheesy things. But Monday, June 4, is really the cheesiest thing ever. 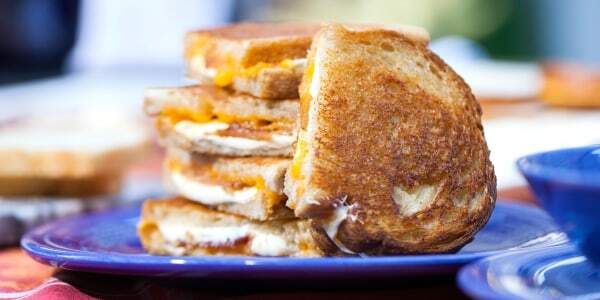 We're talkin' cheddar, brie, Swiss and more: It's National Cheese Day! But can you guess what America's favorite cheese is? Some might assume it's the easy-to-melt, ultra-pasteurized, kid-friendly American. However, in a recent Cheese Day-themed survey, Innit (an app that helps users create personalized meal plans and shopping lists) asked 1,000 people in the U.S. to "brie-fly" — kudos to Innit for the pun — share their their cheese-eating habits. American cheese came in with the bronze at only 14 percent. And the gold and silver? Well, it looks like stateside cheese eaters prefer their cultured dairy British and Italian style. Of course, we're just stumped as to why the British Cheese Company's pink prosecco cheese didn't make the list. And who could forget about the wine glasses and beer mugs made of cheese that Finlandia launched last year... ah, those were the days! To be fair, no cheese won by a landslide. Cheddar had 17 percent of votes, mozzarella had 15 percent, and American followed close behind with 14 percent. Funnily enough, American was the only cheese on the favorites list to also make the least favorites list — make up your mind people! — which were a little stinkier overall. In celebration of cheese, Innit also found that 28 percent of Americans like to switch up different types of cheese in recipes to experiment with new flavors and 23 percent always add extra cheese to their meals. Seventeen percent would eat cheese at every meal ... we might just be falling prey to that last statistic!